It’s with great pride and honor that adampieniazek.com brings you its first ever contest. It’s been nearly six months since this blog’s first post and to celebrate I’ll be giving away a free copy of Ronald Jenkees’ self-titled debut album. Through the months, all of this blog’s crucial statistics have improved (on pace to blow out my high mark for unique visitors tonight), except one: comments! So, in an attempt to increase those numbers, this contest will be very simple; simply comment on this post and you’ll entered for a chance at Ronald’s awesome CD! For those who don’t want to wait a week, you can order Ronald’s debut album directly from his blog. At the end of the contest, all comments will be reviewed and all valid comments (not spam) will be tossed into a pool and randomly chosen. 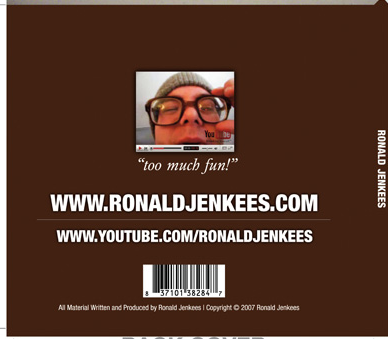 You can comment on anything you want, but I’m interested in how you first heard about Ronald Jenkees and what do you think of his music? This contest will end next Monday at midnight. Make sure you leave an e-mail address when commenting so I can get in contact with the winner. Good luck! Hook it up brotha…that Rocky remix you sent me was SICK! Oohh…. Ronald Jenkees~ My man~~ he turns me on with his fingers. @Ted – The whole CD is sick buddy, remind you to let you have a listen if you don’t win. @Nicole – HAHA…I think you just wrote the title for Ronald’s next CD! @MY – Wicked sick…dude needs to put out a CD with all his beats and 8-10 MCs rapping over his beats. They make a white guy wanna break it down. Haha…good stuff Jide…nothing wrong with some white man dancing (I’m guilty of the same sometimes)! OK…unless we get any new entrants to the contest in the last few hours here, Nicole will be the winner of Ronald’s debut album (by default, since she’s the only one who left an e-mail address)! If anyone else wants a chance at the CD, just leave a comment here, and fill out your e-mail address! Yo man, i’ve been fan of yours for months now, and i just keep listenning your songs from YTube, but it feels wrong, so i thought to check couple sites of you what i could find, and maybe buy one of them, but im deeply sorry to say that at the moment im so broke that cant afford lol, how stupid it might sound its true. So anyways, i would be so glad if i’d win the CD, it just feels wrong to keep whacking YTube just to hear your songs. Hey Toni. Already gave away this CD. You might want to check out Ronald’s blog. His debut album is less than $10 on Amazon and totally worth it. Here’s my review of the album. Ronald!… well done on anti-procrastinating and when are you *Showing* in Dublin City. Ireland.